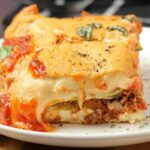 This vegan lasagna recipe is layered with vegan bolognese, vegan ricotta, a vegan cheese sauce and a marinara sauce for the most deliciously decadent lasagna ever! If you’re making the vegan ricotta from scratch as per our recipe, then put your slivered almonds in a bowl, pour over some boiling water from the kettle and leave them to soak for 1 hour. Prepare your vegan bolognese. Mash the tofu with a fork and add to a mixing bowl, process the walnuts into crumbs in the food processor and then add to the mixing bowl. Finally, slice your mushrooms and add to the food processor and process until very finely chopped and then add to the mixing bowl. Mix together. Add the chopped onion to a pot with the crushed garlic, olive oil, dried basil, oregano and cayenne pepper and sauté until the onions are softened. Add in the tofu/walnut/mushroom mix along with the dark soy sauce, tomato paste and marinara sauce and sauté until you have a soft bolognese sauce with no visible liquid. Add in the coconut sugar and salt and pepper to taste. Prepare your vegan cheese sauce. Add the olive oil to a pot and let it heat until hot. Then add in the flour and fry it briefly in the oil, stirring vigorously and then add in your soy milk and whisk it vigorously to get rid of lumps. Bring it to the boil stirring constantly. When it boils let it continue to boil, stirring all the while, for a few minutes until it thickens. Remove it from the heat and add in the dijon mustard, nutritional yeast, onion powder, garlic powder, smoked paprika, salt and ground black pepper and stir in. Prepare your vegan ricotta according to the instructions on the linked recipe. Add a thin layer of marinara sauce to the bottom of a deep 9×13 baking dish. Then add 4 sheets of spinach lasagna noodles. Then add half the vegan bolognese and spread it into an even layer. Then add a thin layer of vegan cheese sauce. Then add a layer of sliced zucchini. Then add all the vegan ricotta into one thick layer. Then add another layer of marinara sauce. Then add another thin layer of vegan cheese sauce, leaving the remainder to add on last. Then add the rest of the vegan bolognese. Then add another 4 sheets of spinach lasagna noodles. Then add another layer of marinara, leaving a small amount behind for decorating the top. After 30 minutes bring it out, remove the foil and add all the remaining vegan cheese sauce to the top. Return to the oven and bake uncovered for a further 20 minutes. Bring it out, stick in a knife to make sure it’s cooked, and then add a generous drizzle of marinara sauce to the middle section of the baked lasagna. Decorate with fresh chopped basil, dried basil and ground black pepper. *These mushrooms are also known as ‘portobellini’, ‘baby bella’, ‘cremini’ or ‘baby portobello’ mushrooms. *We used a simple store-bought marinara sauce. Use whatever marinara sauce is your favorite. *Brown sugar can be used instead of coconut sugar. *We found soy milk the best for this vegan cheese sauce in light of the other flavors of the lasagna. It just worked really well. We also tried some with coconut milk and it works fine, but for overall flavor with the other elements of this lasagna soy milk tasted best. *You don’t have to use spinach lasagna you can use plain lasagna, that’s up to you. Ideally you want to use a brand that does not require pre-cooking.